John Darnielle, lead singer and sometimes solo artist behind the indie "group" The Mountain Goats , no longer sings one of his signature songs in concert. "Going to Georgia," at first glance a tender love song ("the most remarkable thing about coming home to you is the feeling of being in motion again," Darnielle opines) has dark underpinnings; it seems to be a love story, but it's also the story of a man who crosses county lines with a gun to meet his true love: "You smile as you ease the gun from my hands/I am frozen with joy right where I stand." Of "Going to Georgia," Darnielle now writes in his tumblr: "I don't play 'Going to Georgia' any more [sic] because I can’t really reconcile how buoyant it is with how much I dislike its narrator—when I wrote it, I enjoyed that tension, but I was more of an aesthete then and now I think more with my gut. My gut tells me the whole deal with 'Going to Georgia' is bogus, so that's that. A better song would be one from the perspective of the person whose former partner has shown up on the porch of his/her house with a damn gun, that's the hero of the song whose story is more interesting from where I'm at now." And yet many of Darnielle's other songs are also haunted by the specter of violence. For example, his popular "Against Pollution" includes the following lyrics: "A year or so ago I worked at a liquor store/And a guy came in/Tried to kill me so I shot him in the face/I would do it again/I would do it again." "Matthew 11:14-19" features a crazed, gun-wielding prophet; "For Charles Bronson" describes a day in the life of the cinematic gunfighter. Darnielle's musical output is vast enough—fourteen albums, a half-dozen cassette releases, twenty EP and single releases—that one can't quite call this a motif, but it certainly is a recurring element. And it appears at the heart of Wolf in White Van , Darnielle's second novel. Wolf in White Van tells the story of Sean Philips, a disfigured shut-in whose face was destroyed in a mysterious gun-related accident and who relies on subscriptions to a play-by-mail adventure game (think: a post-apocalyptic Zork ) to both provide income and weakly tether him to the outside world. The Trace is a good place. It is a place where people can go, in their imaginations. That is a good thing and while I'm sorry it went wrong for your daughter it is not wrong by itself. Sean is then, perhaps, not the healthiest of role models; one can't help but wonder what the narrative would look like from the perspective of the two teenagers caught in the web of Trace Italian who eventually expire due in no small part to Sean's actions. But the moral quagmire presented in Wolf in White Van (like the similarly morally grey body of work that Darnielle has built in The Mountain Goats ) doesn’t necessarily impact its quality—it remains a powerful novel. In these small, significant details, Darnielle reveals a world—our world—that Sean seemingly believes is imbibed with a strange, potent magic which goes utterly untapped. This is a novel of depression, of inaction, of truisms and tautologies, of games which fail to transcend our own reality and so lead to ruin, of novels that are keys to one's development and yet go utterly unread. 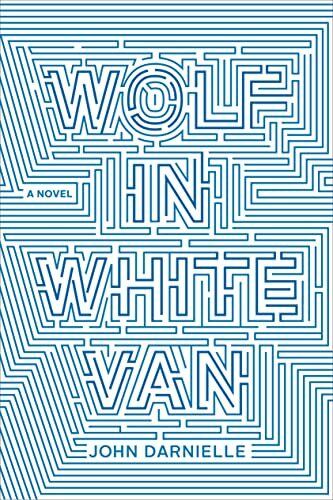 Wolf in White Van is not an easy book, though it is a slim book, and Sean Philips is in no way an easy character even though it's easy to dismiss him as a cliché: sci-fi fan, shut-in, broken, depressed. But there's something deeper about this narrative, something more. Like Darnielle's "Going to Georgia," which wraps a tale of not-at-all romantic gun violence in a rocking, fist-pumping anthem, Wolf in White Van tells the story of unhealthy escapism, suicidal ideation, and dysthemia in an accessible, strongly written, and nostalgia-laden little novel. It's a powerful achievement, made more powerful for its contrasts and complexities.